In 1670 Charles II of Britain granted a charter to the "Governor and Company of Adventurers of England Tradeing [sic] into Hudson's Bay" giving the company absolute control over the territory drained by the rivers flowing into Hudson Bay. This charter marked the founding of the Hudson's Bay Company, a venture that was to figure importantly in the history of Canada and the fur trade. Initially, trading posts were built in the Hudson Bay region, but by 1821 the powerful trading company had extended its interests all the way to the Pacific coast. Most of the furs traded at these posts were trapped by Aboriginals who bartered the pelts for goods at Company stores. In order to facilitate this exchange, the "made beaver" - the value of a prime beaver pelt-was established as the unit of account. When a trapper brought his furs to the trading post he would receive in return a pile of tokens valued in made beavers. He was then able to select goods from the Company store until his supply of tokens was exhausted. Before metal tokens came into use, locally produced tokens of ivory, stone, bone and wood were used at some Hudson's Bay Company posts. The brass token is the size of a Canadian 25-cent piece and is one of a set of four denominations valued at 1, 1/2 and 1/8 made beaver. These tokens, which were used in the East Main District east and south of Hudson Bay, do not bear a date but were struck sometime after 1857. 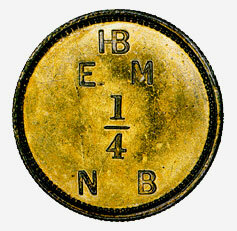 The letters on the token have the following meanings: HB (Hudson Bay), EM (East Main), NB (made beaver) - the N is a die-cutter's error for M. This token is part of the National Currency Collection, Bank of Canada.